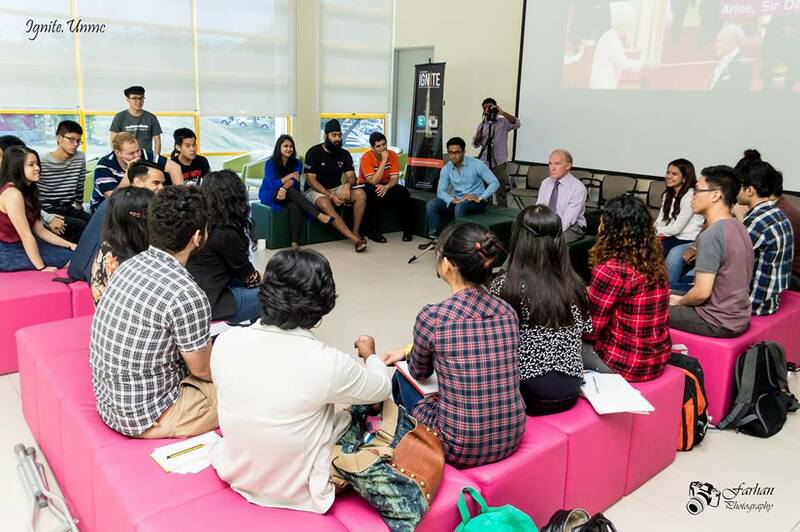 On 20 November, students from across the Malaysia Campus enjoyed an hour-long Q&A session with Sir David Greenaway, the University’s recently-knighted Vice-Chancellor. The event, the first of its kind on the Malaysia Campus, was organized by a coalition of student media groups: IGNITE, the student magazine; the Digital Arts Guild (DAG); and the Young Entrepreneurs Society (YES) media section. The audience included the Presidents of UNMC’s Student Council and Student Association, along with an eclectic group of UNMC students representing each of the faculties, and as many of the campus’s tremendously diverse student population as possible. The session was moderated by IGNITE Editor-In-Chief Soumya Bhat and Nottingham University Model United Nations (NUMUN) Chair Arvind Jayaratnam. With no fewer than five video cameras and a number of stills photographers on hand, Sir David could be forgiven for thinking that he was fully in the media spotlight, rather than the plush lounge of the new Student Association building. Footage from the event will be uploaded to the media organisation’s channels in the coming days – initial snaps are already on the facebook pages of IGNITE and DAG. Most clear throughout was the pride Sir David takes in the University’s achievements during his time in office. He spoke passionately about the development not only of the Malaysia campus, but also of the Jubilee campus in the UK, built on the site of the former Raleigh Cycles factory – a location famous not only for the world-class bicycles that were produced, but also as the setting for Alan Sillitoe’s novel Saturday Night Sunday Morning and its subsequent adaptation into an award-winning film, starring Albert Finney. Sir David, a passionate cyclist, was clearly alert to the coincidences and ironies of this history. The session was not all concerned with the life of the university, however. Audience members will probably take away, in particular, memories of a touching moment when Sir David reflected on his feelings as he waited in the wings before meeting the Queen. The ceremony took place at 11am on the 11th of November: the very moment of the annual two minutes’ silence in the UK, in remembrance of those who died in war. Moreover, clearly moved, Sir David explained how he had arrived at the Palace having just visited, with his family, the Tower of London’s extraordinary remembrance poppy field (poppies became the symbol of remembrance because they flourished in the flanders fields where so many died in the 1914-18 War). One can only imagine the emotional impact involved, at the very centenary of the outbreak of the conflict, standing in such surroundings. It was this striking insight into Sir David’s humanity that was arguably the most telling takeaway from the event. Reporting and photography by the IGNITE team. Further coverage to come on the IGNITE pages.For further information please contact smc@nottingham.edu.my .